In How Can You Sleep At Night?, Christian Taylor delves into the world of climate change, death and insomnia. 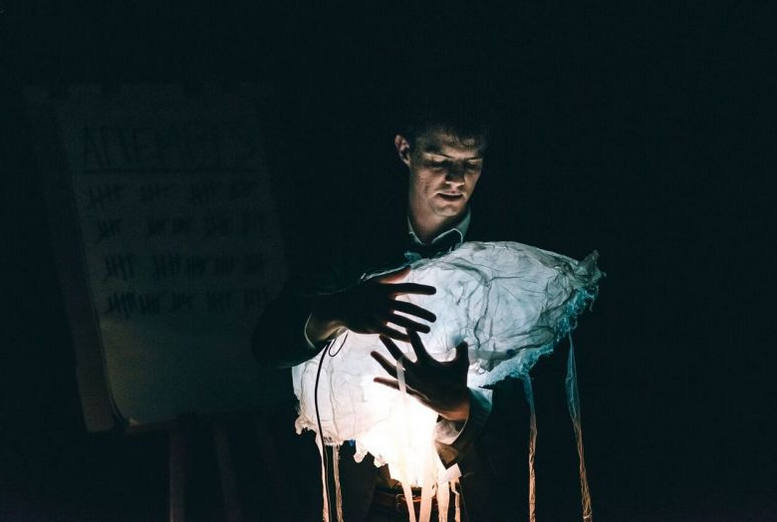 While I was initially uncertain on how one could cover these three topics in detail and with clarity in a 60 minute show, Taylor easily accomplishes this and much more with his debut solo performance for the Melbourne Fringe Festival. Taylor is having somewhat of an existential crisis about the world while also dealing with what happened to Andy. He can't sleep at night and the only one that he seems to be able to talk about this to is to a sentient jellyfish, voiced by a different actor every night. On the performance I attended, Hayden Burke had the honour and his sassy banter with Taylor was full of laughs and deep thoughts. If there were an award for best non-human performance in a Fringe show, it would go to the jellyfish. Taylor is charmingly honest and vulnerable on stage, freely allowing the audience to see his anxieties and worries. His story-telling is engaging and while he shares seemingly unconnected thoughts and ideas, by the end of the show he manages to bring them all together with ease. There are some really touching moments throughout the show and to see people decline Taylor's offer to dance the waltz with him was upsetting such was the emotional response he elicits. The intelligent set design and visuals aids used throughout the show prevent us from getting too overwhelmed or confused by the science and astrophysics information regarding the galaxy, gravity and mass. The lighting used is also well thought out, particularly when Taylor gets us to imagine looking up into the sky and seeing all the colourful stars that are out there. Somehow Taylor has to try and make sense of all this confusion and uncertainty over the future - we all do. How Can You Sleep At Night? doesn't seek to give us the answers, but it wants us to think about them and how our choices will ultimately affect us and everyone around us. Until then, as Taylor and the jellyfish acknowledge, all we can do is just keep swimming. *Original review appeared on TheatrePress on 19 September 2016.